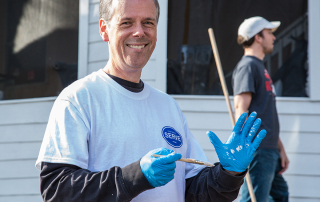 The Great Day of Service is PRUMC’s annual community volunteer day. At this favorite outreach event all ages put their faith in action as they serve those in need across Atlanta. Each year during Lent nearly 1,000 church members and friends take this Saturday to make helping others a priority. It is truly a great day of sharing our time and talents with the charitable agencies Peachtree Road supports. Volunteers will interact with the senior adults possibly playing bingo, doing arts & crafts or having a sing-a-long! Volunteers will assemble Birthday Bags to be distributed to the youth throughout the year. There may even be time to do an activity with the kids! 3. Fellowship of Christian Athletes | Urban BaseballVolunteers will join youth in baseball games at Carver YMCA with one game in the morning and one game in the afternoon. During the games, volunteers will staff the concession stand. Great for baseball fans of all ages! Volunteers will deliver the fruit baskets assembled at PRUMC to the elderly widows of HopeWorks. It will be worth it just to see the smile on their faces! Volunteers will take children and their families bowling. This is a great project to do as a family with opportunities to visit and minister with families from Jerusalem House. Volunteers will set-up and staff a Family Day for the returning citizens and their families. There will be a cookout, games, activities and a DJ! If you love Spring festivals, this project is for you! Volunteers will set-up and staff a Spring festival for families at SafeHouse. Calling all softball fans! Volunteers will play residents in an annual softball game, followed by cooking hamburgers and hotdogs for residents and volunteers. It’s a home run for everyone involved! If you enjoy field trips and being outgoing to strangers, this is the right project for you! PRUMC volunteers will take 20 homeless children on a field trip or enrichment experience in Atlanta. Location TBD. This project is an opportunity to share career mentoring and knowledge with teens from the Agape Program and Lutheran Services of Georgia. Participants will work through case-study exercises together and have the opportunity to learn more about school and career opportunities. Volunteers will help with staffing as well as sharing their personal stories. Use your green thumb to help brighten the school’s garden atrium! Volunteers will replant flower and vegetable boxes. If you like the musical “Beauty and the Beast” or just musical theatre in general, why not give this project a go? Volunteers will work on creating the sets and costumes for the school’s spring musical. This project will involve painting, costume creation (cutting, sewing, gluing), set carpentry and creative design! Volunteers participate on the church’s 48th Habitat home. This project will run from 7:30 until 3:30 and will not meet at the church. Tasks for that day are: Continue interior & exterior painting. Install baseboards, window sills & interior trim, kitchen cabinets & countertops. Continue soffit & fascia board installations. Do you enjoy landscaping? This project is for you! Volunteers will provide landscaping for 3 BeLoved homes and create raised gardens at 1 home! Do yardwork and clean-up at the home of one of HopeWorks elderly widows. Spend time with her and you will hear some wonderful stories! Calling volunteers looking for an outdoor project! This project involves providing some TLC for the Jerusalem House property. Activities include raking leaves, trimming bushes and hedges, planting flowers and vegetables. Volunteers will paint a thirty foot section of iron fencing along with beautifying the property through various landscaping jobs. The Wesley Foundation at GA Tech is a non-profit extension of the UMC serving the students of GA Tech. Volunteers will work with the PRUMC Men’s Ministry team to beautify the property through landscaping and planting. Volunteers will give some much needed TLC to the property for the residents there. We will clean up the gazebo area, the gardens and the horse shoe area. Do you LOVE organizing? This is your project! Volunteers will clean and organize the Women’s Kitchen pantry and kitchen space. This project also includes installing additional shelving. Volunteers will help make repairs on an E. Rivers student’s mobile home. Volunteers will help make repairs on an E. Rivers student’s home. Volunteers will help make home repairs on an older adult’s residence. This project has been canceled. This project is for volunteers wanting to provide some TLC to spaces that are well-loved by children each day! Volunteers will install new shelving in classrooms, clean toys and cots and also reorganize the children’s library. It’s a MAKEOVER! If organizing and designing spaces are some of your favorite activities, this project is for you! Volunteers will makeover 5 rooms for the women and children staying in this shelter. Share your landscaping talents with another church! Volunteers will be doing much needed yard work and repairs for the church. This project is a great opportunity to provide TLC to a well-known historical site in Atlanta – right in our neighborhood! 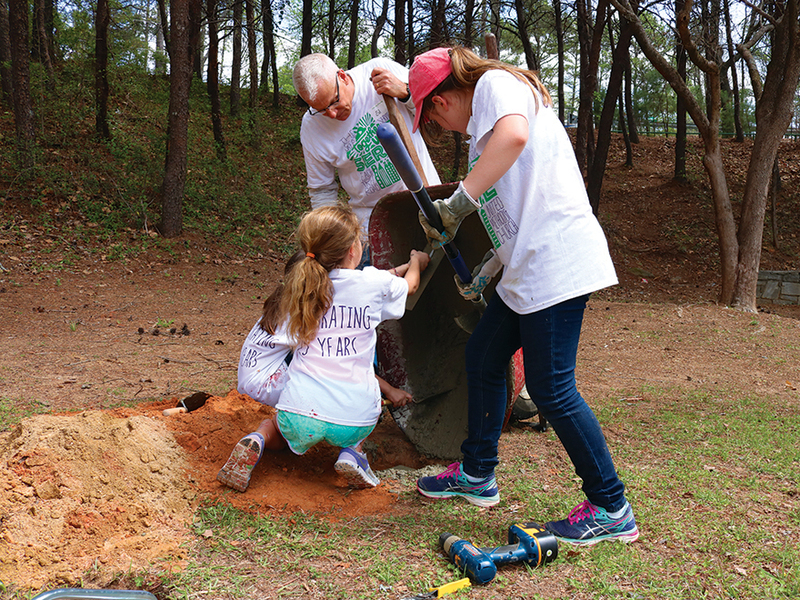 Volunteers will clean the playground and cemetery and do planting on the grounds. Volunteers will clean and organize at the renovated, expanded THRIFTique, BCM’s thrift store. All in preparation for the grand opening event in April! Volunteers will sort and package donations of medical supplies to help save lives of patients at MedShare’s partnering hospitals and clinics in underserved communities around the world. Share your love of sewing for babies in need of warmth. Volunteers will make baby blankets for newborns at Grady and the newborns of Christmas Kindness recipients. Do you want to participate with your family in GDS but only have an hour or so to give? Sign-up for Family Projects! Families will work together on many different projects: food sorting for Buckhead Christian Ministry, making snack bags for the Redemption Community UMC, making birthday kits for Action Ministries and making boxes for the Homeless at Heart Project – just to name a few. Volunteers will assemble fruit baskets to be delivered to the elderly widows of HopeWorks. Volunteers will assemble hygiene kits and lunch bags for the Homeless Ministry at PRUMC. Volunteers will help make peanut butter sandwiches to be distributed to area homeless shelters. What time does The Great Day of Service start? What time does my project end? Each project length is different. They end anywhere from 10:30 am – 3:00 pm. Your project captain will confirm the length. Do I need to bring anything to my project? Your Project Captain will contact you with information a week before the Great Day. Usually we provide all the necessary equipment. Do I need to bring lunch or water? Water is provided by the church and lunch will be provide your Project Captain if your project continues during lunchtime. How do I know where my project is? You will receive an email the week of the GDS with complete details and directions to your project. Do I need to come to the church first? Or can I go straight to my project? You can meet either at the church, or at your project. We recommend coming to the church so that you may experience communion with the large group. Wear casual clothes that can get dirty. If it rains, and you are on an outdoor project, you will receive instructions to your rain plan (indoor) project. How do I get more information on who we are helping? To learn more about the agencies we are helping, ask your project captain for information or link to their website from www.prumc.org. How often is the Great Day? Are there more throughout the year? The Great Day of Service occurs once annually during Lent. Can I count this toward school service hours? To count The Great Day toward school service hours please email Beth Spencer at beths@prumc.org. Register online or on a paper form located throughout the church. What are the age breakdowns? Is there a nursery for children too young for projects? The registration form indicates approrpriate ages for each project. Nursery is available at the church for 4 months to 4 years. We have planned outreach activities for ages 4 to 7 at the church. Some off-campus projects take children as young as 4 years old. Beth Spencer has been at the helm of GDS through her 20 years as director of Lay Volunteer Services and now Local Outreach for Peachtree Road. We talk with Beth about the heart, history and experience of GDS. Q: So how did GDS get started? A: GDS was the idea of Rev. Vickie Smith, then a PRUMC member and volunteer and now an ordained minister herself. Her brother’s church in Alabama had tried a similar idea. At the same time, the Disciple bible study was taking off and the members were acting on what they were learning – to go out into the world and do good. PRUMC was a very financially generous church then, but not as generous with our time as we are today. The combination of these factors led us to create the Great Day of Service, in the spirit of Lent, when members and friends would sacrifice what they would normally be doing that day and take on a day of service that could change their lives and the lives of others. Rev. Smith pitched the idea to Rev. Don Harp and told him that she thought we could have 100 volunteers; he said we will have 500, and he was right! A: It went from 500 volunteers the first year to almost 2,000 about 15 years ago. We have settled on closer to 1,100 volunteers today due to the abundance of outreach opportunities that happen now on a weekly basis. Q: Is this a United Methodist program or unique to PRUMC? A: The Great Day is unique to PRUMC, but we have had the honor to help many churches throughout the country start their own. 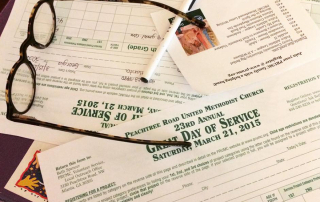 The UMC Annual Conference now includes a day of service each year as well. Q: Tell us what the Great Day of Service means to you. A: It is the backbone of the Local Outreach Ministry at PRUMC. Many charitable agencies have become permanent PRUMC partner agencies after participating in GDS, and members have found great friendships working together on projects. We have even had people meet and then get married after working on a project together! It is one of the few times that we as a congregation come together in a relaxed setting to worship and then go out to serve others. All ages come together and that’s a good thing! Q: How many agencies do we serve each year? A: We have had as few as 15 and as many as 90 depending on the number of projects each participating agency has for us to tackle. This year we will have 36 projects serving 40 agencies. Q: What ages are the GDS volunteers? A: Newborn to 100 – there is truly a project for all ages and stages! We even have volunteers who have been with us since the beginning. Q: What is your favorite part of GDS? A: I have two favorite parts: The communion service with the fabulous Ron Greer homily that kicks off the event, and then sharing stories when folks come back to the church after projects are complete. All the hard work has paid off when the volunteers have had a good experience and want to come back and volunteer again. A: The wonderful volunteers of Peachtree Road! GDS – Never too many cooks in THIS kitchen! 4 families. 4 trailers. 4 hours.